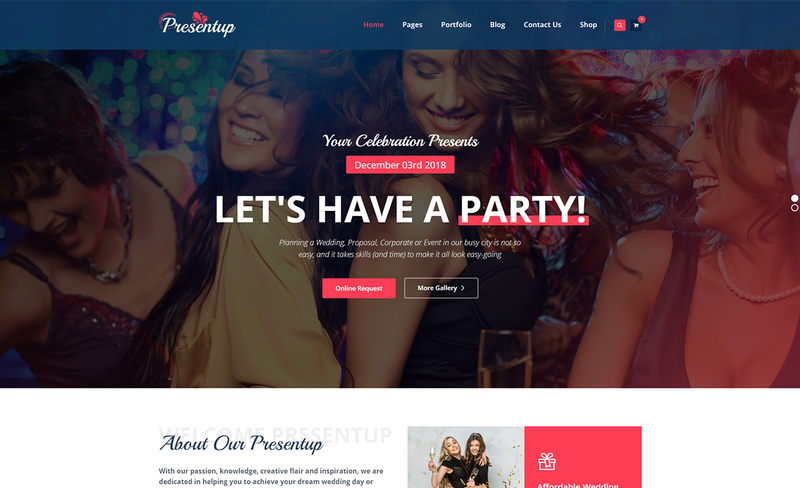 Presentup — Premium multipurpose WordPress theme that is a perfect solution for creating a professional website for Event Planner (both individual and agency), Wedding planner, Professional Decorator, Celebrations, Trade Expos, Award Ceremonies, Annual Functions Management Company (Agency) websites. Woocommerce functionality lets you sell events, celebration products on your website. Presentup Theme has beautiful & unique design that will be best suited for your agency(company) online web presence like events, our works, testimonial and team pages etc. It has 100% responsive design and tested on all major browsers and devices. Theme based on Codestar WordPress Framework, WPBakery Page Builder, and Slider Revolution plugin. The Presentup comes with 3 different pre-made homepages, has unlimited creativity in design and colors, flexible layouts and super powerful functionality for portfolio and other elements – anything you might need to make a beautiful website.